With the oil cleansing method you apply oil to your face as a cleanser. The oil removes dirt, makeup and any facial oil. 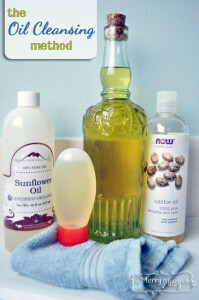 The oil both cleans and moisturizes the skin. In this post Sara also explains how sulfates in commercial facial soaps and body washes strip away the natural skin oils. This dries our skin and the body then ends up overproducing oil to compensate. Using oil to clean your face eventually restores the body to balance and you end up with clean, soft skin. The recipe for the oil cleansing includes castor oil, a carrier oil like Sweet Almond Oil and a suggested combination of essential oils. Sara also has a chart so that you add the right ratios of ingredients depending on your skin type. Finally, Sara also provides a wonderful way to wash your face with steam and your prepared oil. This is a good, informative and helpful read! lick on the The Oil Cleansing Method – Natural Non-Toxic Face Cleansing link to see the complete article.